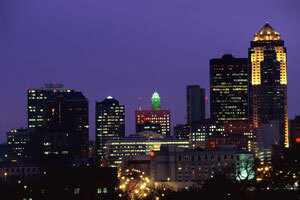 Des Moines is home to over 200,000 residents and is the capital of the state of Iowa. Being the state capital has created an environment full of opportunity for effective advertising. Cultural venues like the Civic Center of Greater Des Moines and the Des Moines Arts Center would yield high traffic exposure of your business. Target your audience with digital signage advertising or other indoor billboards in Wells Fargo Arena. Attractions like the East Village, Adventureland, and the Prairie Meadows Racetrack and Casino draw in thousands of visitors every year and would be a prime location for out-of-home advertisements. Billboards on I-35 or I-235 would also be a billboard possibility.